In this July 18, 2018, file photo Donald Trump Jr. speaks at a rally for Florida gubernatorial candidate Rep. Ron DeSantis in Orlando, Fla. The president’s eldest son is coming to Maine in October to raise funds for the state Republican Party and its challenger to U.S. Sen. Angus King. 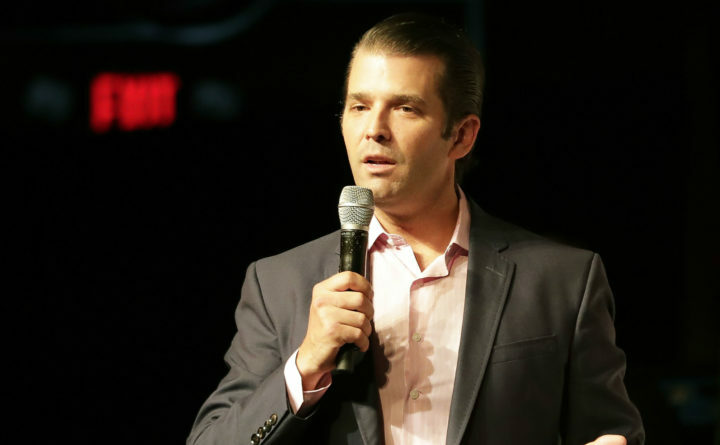 Donald Trump Jr. and the state GOP will host a $100-per-person reception at a Portland hotel to support state Sen. Eric Brakey, R-Auburn, the party’s underdog challenger to King, and other candidates in the final weeks before the November election. The Maine GOP announced the Oct. 1 fundraiser the day after King, an Independent who caucuses with the Democrats, said he would vote against President Donald Trump’s latest nominee to the U.S. Supreme Court. The reception at the Portland Holiday Inn will also include Mark Holbrook, who is running against Democratic 1st District U.S. Rep. Chellie Pingree and Independent Martin Grohman, as well as outgoing Gov. Paul LePage and other state Republican leaders, according to an invitation. In a statement, Brakey said that he’s “thrilled” to help host Trump Jr. and that the visit will be a “huge” boost to his effort to unseat King. Brakey and Democrat Zak Ringelstein of Yarmouth are competing against the incumbent senator, who was heavily favored to win in a August poll of the three-way race. President Trump visited Maine five times while seeking his party’s nomination and then the presidency, but he has not returned to the state since taking office. Trump Jr. likewise made his last public appearance in Maine in 2016, when he stopped in Lewiston and chastised Republican politicians for not supporting his father. Targets of his criticism included U.S. Rep. Bruce Poliquin, who is running a closely watched race to keep Maine’s 2nd District in Republican hands but is not listed among the elected officials and GOP leaders hosting the Portland event. A spokesman for second-term representative — who faces a challenge from Assistant House Majority Leader Jared Golden, D-Lewiston, and two Independents — said that Congress is scheduled to be is session and Poliquin in Washington, D.C., on the day of the fundraiser.